The University of California San Diego’s American Chemical Society-Student Affiliates (ACS-SA) recently earned both Outstanding Chapter and Green Chapter awards for academic year 2016-2017. The national ACS Committee on Education reviewed chapter reports from across the nation and its territories to determine which programs and activities deserved recognition in three categories: outstanding, commendable and honorable mention. It also recognized chapters that complete green chemistry activities—those that minimize the use and production of hazardous substances. UC San Diego was among the 52 outstanding student chapters and one of 56 green chapters recognized. More than 300 organizations were considered for the awards. ACS student chapters are pre-professional organizations for undergraduate students with an interest in the chemical sciences. Members participate in a wide range of programs and activities that enhance their college experience and prepare them for successful careers. At UC San Diego, the student chapter has a three-pronged mission: to foster a community among chemistry undergraduates; to facilitate discussion among faculty, undergraduates and graduate students; and to present chapter members with a variety of career options in chemistry. “The dedication of our chemistry undergraduate students to fully engage in the field at their earliest opportunities always impresses me. Further, their commitment to working collaboratively for the benefit of our department, and society as whole, is exemplary. I am very proud of our UC San Diego Chemistry and Biochemistry students,” said Edward Dennis, chair of the department. The campus group meets weekly for talks by guest speakers from industry, academe and other chemistry-related professions. It also holds quarterly student-faculty mixers, laboratory tours, field trips and professional development activities. Additionally, it hosts the annual Undergraduate Chemistry Research Symposium, while engaging in community service and outreach, and regular social events like laser tag, kayaking and movie nights. Membership helps students to develop their career readiness competencies, including future leadership within the group, and to establish a record of interest in the field. UC San Diego ACS-SA President Susanna Yee explained that the team of officers on campus works tirelessly to plan events, making sure that each meets at least one of the group’s three objectives. The campus chapter also hosted three green chemistry events throughout the year, including a talk by Vicki Grassian, distinguished chair of physical chemistry; a green chemistry game night and participation in the annual San Diego EarthWorks EarthFair at Balboa Park. “While it is reward enough for us to witness and hear from our members how much they enjoy our weekly events, it is immensely gratifying to see our efforts recognized at a national level,” said Yee, who looks forward to a trend of outstanding success. 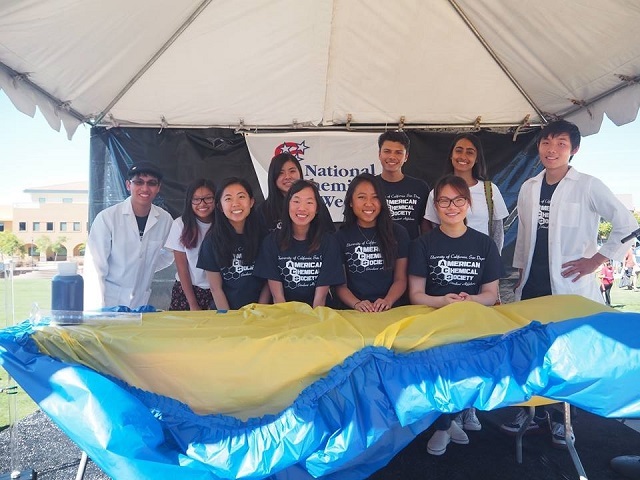 With a primary focus on outreach, each year ACS-SA participates in ChemExpo, an event for local middle and high school students sponsored by the San Diego professional chapter of ACS. Campus officers present demonstrations at the event and field questions. Members also perform outreach through beach clean-ups and community garden work. Importantly as ACS-SA members, students build relationships with fellow science students in a relaxed and enjoyable environment. “For me, what I enjoy most about ACS-SA is the community. The people you meet through this organization and the bonds you form with them are irreplaceable,” said Yee. Department of Chemistry and Biochemistry faculty advisors Stacey Brydges and Thomas Bussey explained that ACS-SA has become a cornerstone of camaraderie and enrichment for UC San Diego undergraduate chemistry majors, thanks to the creativity and commitment of its student leaders. The Department of Chemistry and Biochemistry at UC San Diego is committed to excellence in research, education and service. As part of that mission, and as a department within the Division of Physical Sciences, it values and promotes equity, fairness and inclusion of diverse members.